This page is all about the Share section of the Customize panel. If you’re looking to share your videos, head over to the Sharing Your Wistia Videos page. The Share menu is our name for the collection of social sharing options that can be added to your video that make it easy for your viewers to share your video in their social networks. To add share buttons, navigate to the video you’d like to add them to, and choose Customize from under the ▸ Video Actions menu. In the Customize panel you’ll see an option to add Share options. Click the option, and this will turn the Share buttons on ◉. 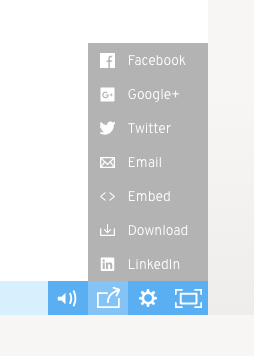 Share has a bunch of buttons — which we can split into two buckets. All of these buttons work pretty much how you think they will. When clicked, the sharing button will share the video content on a viewer’s chosen social media account. If you’d like to further customize the associated webpage that’s referenced in the share, make sure to check out the Buttons Link to section. You may have noticed an option to Configure the Twitter and Download buttons. Keep reading for more information on just exactly how that works. Wistia allows you to configure some of the social buttons, to further customize your viewer’s interaction with your content. You’ll be able to configure the Twitter and Download buttons. 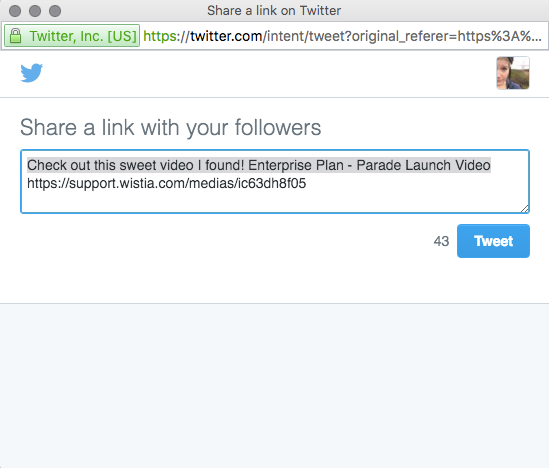 When someone clicks on the Tweet button below your video, they’ll be prompted to create a tweet about the link they’re sharing. By default, this is the title of the video. But you can customize the tweet to line up with your brand. 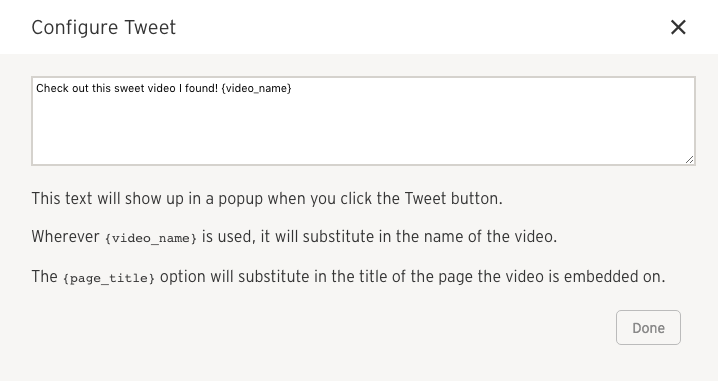 Just select the Configure button next to the Twitter option, craft your awesome tweet, and make sure to hit Done. You can also configure the Download button to specify the quality of video download. Viewers can download the Original File, the SD MP4 asset (the lowest quality copy we make), or the HD MP4 asset (the highest quality copy we make). The default is the SD MP4 asset. Select the quality you’d like to allow, and make sure to hit the Done button when finished. Keep in mind, allowing your users to download any versions of your video (but especially the higher quality options) will use more of your monthly allotted bandwidth. Check out our bandwidth page for more tips on cutting down bandwidth consumption. You can also use the Share buttons to link to a specific page where you’ve embedded your video, instead of the Wistia media page. 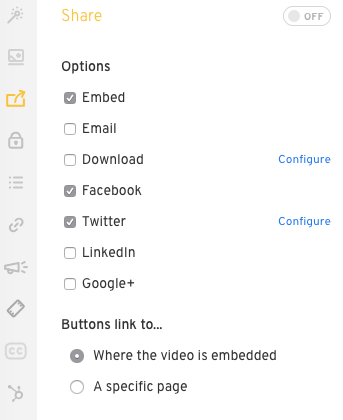 To customize this setting, just head into the Share menu (choose Customize from under the ▸ Video Actions), and change the setting from Where the video is embedded to A specific page. Fill in the page you’d like the social option to link to, and don’t forget to Save your settings. Want to see who’s clicking the Share buttons in your video? We track that information on the video stats page of your account. Shares for your videos will appear as Actions in the Summary Bar on your video stats page, and on individual heatmaps for your viewers. Check out the video stats page for more! Next up, let’s require a password with the Password feature!